Jennifer Gardiner’s passion for telling stories through her art has led her to author and illustrate her first children’s book titled “A Trip Around the Pond”published by Xlibris). Inspired by her grandchildren, she hopes to share imaginative stories of life as seen through the eyes of young children. “A Trip Around the Pond” tells the story of Georgette Mae’s fanciful search for the city of Paris. After complaining of boredom, Georgette’s granny encourages her to spend her day traveling around the pond. Along the way, Georgette encounters many adventures. Complemented with hand-painted illustrations, the book captures a young child’s innocent heart and vivid imagination. Moreover, the story displays an endearing relationship between a little girl and her granny. 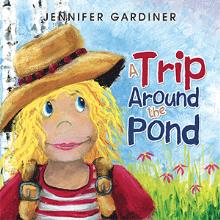 To purchase a copy, readers may visit https://www.amazon.com/Trip-Around-Pond-Jennifer-Gardiner/dp/1984570129. Jennifer Gardiner is an author, artist, wife, mother and grandmother. She is a partner in her family farms. Gardiner is known for her unique artistic talents and flair for design. She has spent many years encouraging children to use their imaginations to draw and paint without inhibition. “A Trip Around the Pond” is her first publication.